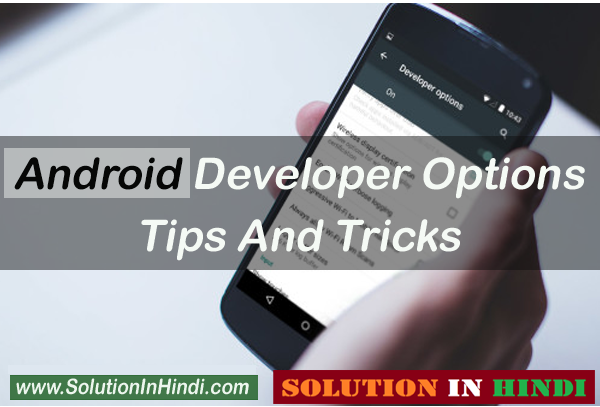 Friends Aaj Ham Baat Karenge Top 6 Best Hidden Android Developer Options Tips And Tricks In Hindi Ke Bare Me, Dosto Jaise Ki Previous Post Developer Options Kya Hai? Developer Options Kaise Enable Kare Puri Jankari Yaha Hai. 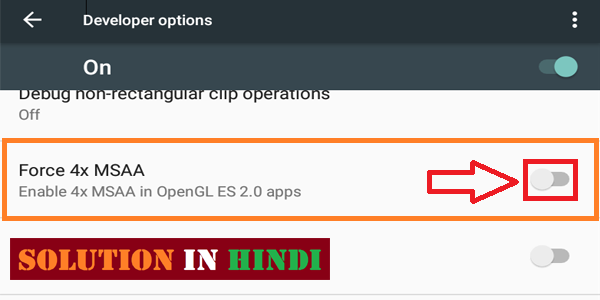 Agar Aap Abhi Tak Developer Option Ko Enable (On) Nhi Kiya Hai. Toh Pehle Uper Dye Gaye Link Me Jake Developer Option Ko Enable Kare Phir Is Post Ko Read Kare. Aap bhi developer options ko enable karke apke man mutabik Android mobile phone ko customize kar sakte hai. Developer options me bohut sare Android Hidden Features diye gaye hai. Jisse Aap mobile ko without root kar ke android mobile ko customizes kar payenge. Developer options lag bhag sabhi smartphone’s me available hote hai. Or yeh common user ko pata nahi hota. Kyu ki har ek mobile me pehle se developer options enable nhi rahta. Developer Options ko manually enable (On) karna padhta hai. Doston agar aap chahate hai bina root wale android mobile ke Look and Performance Improve Karnege Ya device ko advance use karenge toh aapko developer option ko enable karna hi padega. I Hope aap previews post se developer apke mobile me enable kar liye honge. Toh chale details se jante hai. Usse pehle aap mind ko thoda free karle kyu ki ye article thoda lamba hai, Or carefully read karna hoga. toh chale jante hai android hidden tricks and tips in hindi. Kyu Ki Ye Device Ki Advance Features Hai, Gaalat Use Karne Se Apke Mobile Par Effect Par Sakta Hai. Lekin Ghabra Ne Ki Koy Baat Nhi Hai Niche Step By Step Sari Jankari Dye Gaye Hai, Aapko Sirf Carefully Read Karte Rahna Hai Phir Mobile Me Experiment Karna Hai. Dosto Niche Android Developer Options Ki Top 6 Tips And Tricks Details Se Diye Gaye Hai Apko Sirf Carefully Read Karna Hai Phir Apke Android Phone Ko Coustomize Karna Hai. Toh Chale Start Karte Hai. So agar aap mobile me Stay awake ko enable karenge toh apke screen lock nhi hogi. Or isse apke battery par bhi bad effect nhi padega. 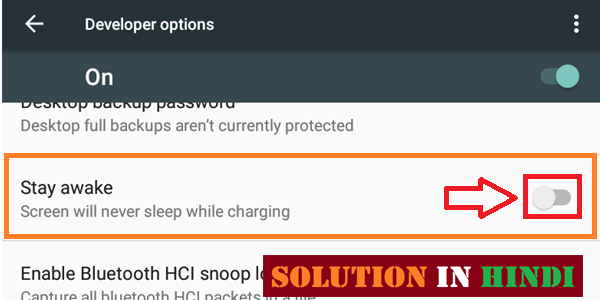 Tab tak screen lock nhi hogi jab tak apke mobile ko charging se nhi hatate. Lekin iska matlab ye nhi ke charging time screen lock nhi hoga. Screen off karne ke liye apko simple power key press karna hoga. Dosto ye feature mujhe bhut acha laga. So Agar aap bhi Is feature ke maza lena chahte hai. toh chale step by step jante hai Android mobile me stay awake enable kaise Karte hai? Sabse Pehle Device Settings Me Enter Kare. Ab Niche Developer Options Par Click kare. Now Developer Option Ko Enable (ON) Kare. Ab Developer Options “Stay Awake” Find Kare. Stay Awake Mil Gaye Hai Toh Uspar Click Karke Enable Kare. Done! Now Apke Device Me Stay Awake Enable Ho Chuka Hai. Note: Agar Apko Advance Use Nhi Karna Hai Or Disable, Matlab Baand Karna Hai Toh Apko Sirf Developer options OFF Ya Phir Jis Option Ko Enable Kiye Hai Usko Band Kar Ne Se Wapas Jaise Tha Same Wayse Ho Jayega. Ye Tricks Use Karne Se Apke Mobile Ki Performance Fast Ho Jayegi, Kyu Ki Limit Background Application Option Ko Enable Karke Background Me Ek Sath 4 Apps Ko Use Kar Payenge. Isse Apke performance par koy bad Effect bhi nhi padegi. So Agar aap mobile me jiyada apps use karte rahte hai. 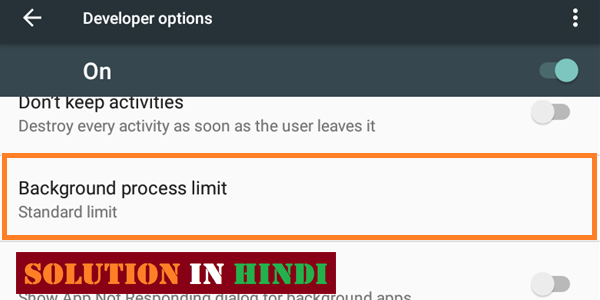 Toh apke liye ye option enable karna bhut better hoga, Kyu ki basically agar aap 2-3 app ko ek sath use karte hai jaise “Facebook Browser” or FB messenger, To apke mobile performance dhimmi ho jati hai, Usi jagaah aap Limit Background Application Option Ko Enable Karke rakhenge toh apke performance par defect nhi padne dega. Background Process Limit Option me apko “Standard Limit”, “No Background Processes”, “At Most 1-4 Processes” Milega. Standard Limit: Is Option Ko Aap Average Performance Ke Liye Use Kar Sakte Hai. No Background Processes: Ye Option Use Karne Se Aapke Mobile Performance Or Battery Life Improve Hogi. At Most 1-4 Processes: Iska Matlab Hai Ke Aap Kitna App Background Me Use Karna Chahte Hai. At most 4 processes kar sakte hai. Matlab Highest 4 Apps ko ek sath chala sakte hai. Ye feature mujhe sabse jiyada pasaand aaya hai. Ok chale jante hai Limit Background Application Ko Enable Kaise Kare? Sabse Pehle Mobile Settings Me Jaye. Settings Me Developer Options Par Enter Karke, Developer ON Kare..
Ab Developer Option Me Background Process Limit Find Kare. Background Process Limit Par Click Kare. Ab “Standard Limit”, “No Background Processes”, “At Most 1, 2, 3, 4 Processes”, Itne Me Se Jo Apko Chahiye Uspar Click Kare. Done! Itna Karne Ke Bad Device Me Is Sare Features Ko Istemaal Kar Sakte Hai. Friends agar aap mobile games me interesting rakhte hai toh is option apke liye bhut hi helpful hai. Kyu ki Force 4x MSAA is option ko enable karne se Games or OpenGL ES 2.0 Application ki graphics quality bhut improve hogi. Jisse gmes me apko better graphics dekhne ko milega. Lekin is feature ko on karne se apke mobile processing power and battery life consumes hoga. Ye Option bhi bhut hi acha feature hai. Device Setting Me Jake Developer Options Par Enter Kare. Ab Developer option Me Force 4x MSAA Fine Karke, Ok Kare. Done! Lijiye Apke Mobile Me Better Gamming Graphics Enable Ho Chuka Hai. Dosto agar aap is option ko enable karke apke mobile phone ki speed ko bhut hi fast ya phir slow apke margee se kar sakte hai. Device me animation Speed feature ko aap developer options se set kar sakte hai. Jee-han dosto is-tricks se aap ke mobile ki transmission speed or windows ki animation speed ko apne se kun ya jyada kar sakte hai. Ab aap soch rahe honge isse apke mobile speed increase kaise hoga. Friends mobile fast work karega ya slow woh device me animation hi sab kuch maintenance rakhte hai. So agar aap device ko fast karna chahte hai toh sabhi Animation ko Disable, Matlab off karna hoga. Sabse Pehle Mobile Ki Developer Options Me Jaye. 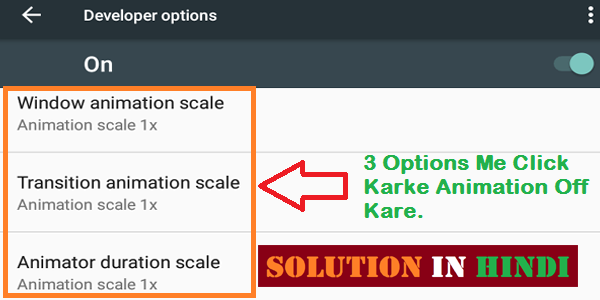 Ab Find Kare “Window animation scale” “Transition animation scale” “Animator duration scale”. Upar deiye gaye 3 option par click karke Animation OFF kardo. Done! Itna karne se apke device ki animation off ho jayega. Our mobile speed kafi had tak badh jayegi. Jee-han dosto is tricks se aap apke internet surfing ko fast kar sakte hai. Matlab Low Wi-Fi Signal me bhi aap fast internet use kar payenge. Kyu ki is option ko enable karne se apke mobile data usage badh jayega. So Is feature ko bhi aap try karke dekh sakte hai. I hope apke liye Useful hoga. First Developer Options Me Jaye. 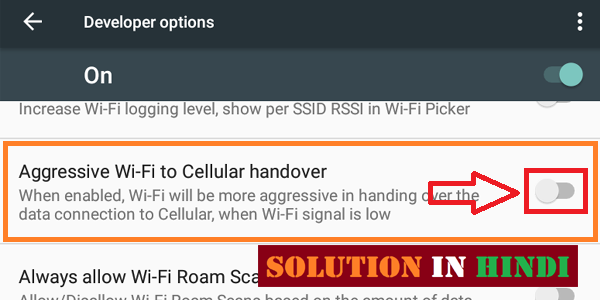 Ab Aggressive Wi-Fi To Cellular Handover Find Kare. Mil Gaye hai toh click karke enable kare. Done! Ab Apke Internet Speed Fast Ho Jayegi. Friends ye option bhi apke liye useful ho sakte hai, Agar aap left-handed hai to aap is trick ko jaroor on kare, Matlab Is feature ko enable karne se apke mobile ke sabhi function left side using ke liye RTL mode me enable ho jayegi. Or ye feature bhi apko developer options me mil jayenge. Developer options me enter kare. 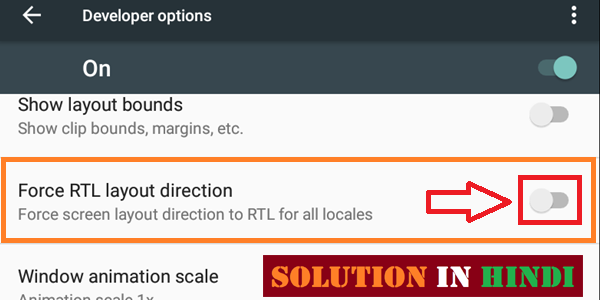 Ab Force RTL Layout Direction find karke enable kare. Done! Lijiye apke mobile left handed RTL Layout Direction ab enable ho chuka hai. Kyu Ki Ye Android Mobile Ki Advance Features Hai, Wrong (Gaalat) Istemaal Karne Se Apke Mobile Par Bad Effect Padh Sakta Hai. So Aap soch Samjh Ke In Sare Feature ko Enable Karke Enjoy  Kare. Or Kahi Kisi Step Me Confusen Ya Phir Developer Options Related Koy Question Ho Toh Directly Comment Box Aaye. Our Haan Ye Sab Feature Istemaal Karne Me Kaise Laga Hame Jaroor Bateye. Nice bhai bahut achhi post hai mene bhi devloper settings par kuch articles likhe hai, aapki post bhi bahut achhi hai. I’m not sure if this is a format issue or someething to do with internet browser compatibility but I figured I’d post to let you know. Thhe style and design look great though! Hope you get the problem fixed soon.